The moon sets over the Atlantic Ocean in this photo taken near the shores of Fonte-de-telha pine forest in Portugal by Miguel Claro on Feb. 13, 2014. 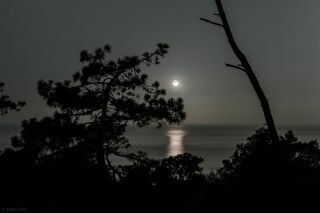 The moon sets over the Atlantic Ocean in this beautiful photo taken near the shores of Fonte-de-telha pine forest in Portugal. Astrophotographer Miguel Claro recently sent Space.com great shot he took on Feb. 13 using Canon 60Da camera (ISO 500 f/4; Exp:10 sec. 35mm). A crescent moon is part way between a half moon and a new moon, or between a new moon and a half moon. You can learn more facts about the moon's phases here.